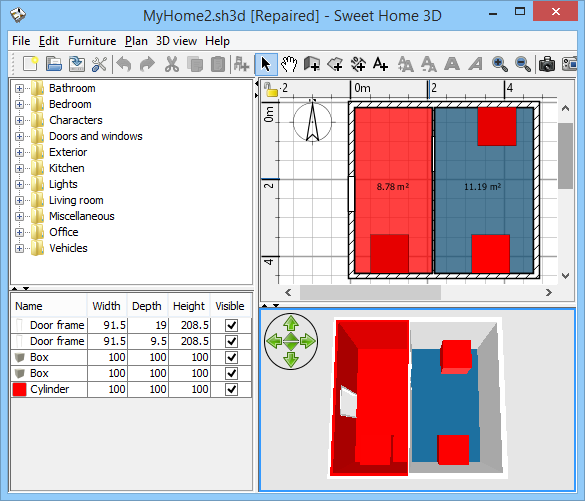 Sweet Home 3D 4.4 was released on June 12, 2014 with the improvements and bug fixes described in version history. Here are the most important changes. 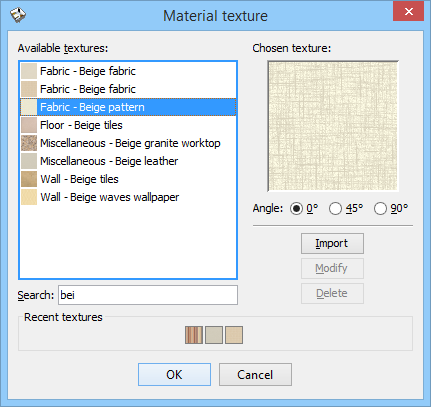 The dialog box that lets you choose a texture for walls, floors, ceilings and materials was updated with a tooltip displaying the texture under the cursor at a larger size, a search text field to filter textures list, the ability to rotate textures and a list of the recently chosen textures. Note that at this moment, the list of recent textures isn't saved when you quit Sweet Home 3D (this feature will probably come in a future version). 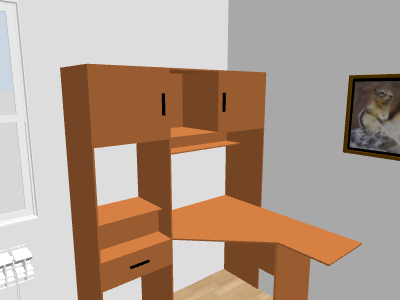 The furniture libraries 1.4 and the furniture coming by default with Sweet Home 3D 4.4 include a new dropOnTopElevation (uneditable) property that will help you place objects on furniture much faster. Imagine you want to decorate the table of the following desk with a computer and other objects. Until now, dropping an object on another one in the plan set its elevation to a value equal to the height of the object. In the case of this desk, some shelves and some other furniture, this led most of the time to a disappointing situation where objects were too high. From the version 4.4, this kind of furniture stores a new property used to set the elevation of objects dropped on it. In the case of the previous desk, this property is equal to the elevation of its table. Thus, dropping objects on the desk will lead now to the following situation. Of course, you can still adjust the elevation of any object afterwards if you want to fill the shelves of the desk or place a chair for example. But I hope this change will help you place objects faster anyway. In some special cases like trees, plants, staircases, curtains, umbrellas,... there's no reason to place an object at its top, and the value given to the dropOnTopElevation property makes Sweet Home 3D ignore the object on which the user drops a new one. For example, if you drop a garden table on a tree, it will now always appear at its bottom, and if you add an umbrella in the middle of the table, glasses dropped on the umbrella will be placed on the table under it. Sweet Home 3D 4.4 comes also with the new Furniture > Reset elevation menu item used to update the elevation of the selected objects according to the furniture on which they are placed, like when you dropped them from the catalog on some furniture in the plan. Imagine you dropped some plates on a table, and finally you replace the table by an other higher one. Until now, if you wanted to update the elevation of the plates, you had to reset their elevation to 0 then make a fake move of the plates to provoke an update of their elevation. Using Furniture > Reset elevation menu item will do the same thing faster. In version 3.6, the ability to edit SH3D files damaged on the disk was removed to avoid the frustration of not being able to save them afterwards. As this choice implied that repairing a damaged file could be done only by program, I received more requests of users to repair their damaged file, and I ended up programming a tool able to handle the most repairable cases. As this tool works well now, I integrated it in Sweet Home 3D 4.4 which tries to repair a damaged SH3D file when you open it. If all the damaged 3D models and images can be replaced without any doubt by their counterpart in Sweet Home 3D catalogs, a message will be displayed to report the issue and encourage you to save the repaired home. If the file couldn't be repaired completely, Sweet Home 3D will prompt you to choose what the program should do with the damaged data. You'll have the choice between removing the damaged furniture and images, or to replace them by red boxes and red images. These red parts in the home will help you to identify the damaged parts as in the following example where only walls and doors weren't damaged. If you still get a message reporting that Sweet Home 3D can't open your SH3D file, there are lots of chances that nothing can be repaired. Finally, to ensure that saving a home won't corrupt its existing SH3D file when the disk is full, Sweet Home 3D now checks the space available on disk before really writing a file. 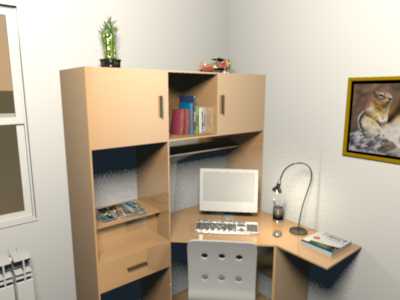 Users who logged in the Online version are now able to import a SH3D file on sweethome3d.com server to edit it online. To reduce the size of the home data that have to be exchanged with the server and to save disk space on the server, Sweet Home 3D will make its best to find among the furniture and texture of the imported home, the ones that are publicly available in the Online version. Thus, only data unknown on the server will be uploaded to the server when a home is saved. If the size of this data is higher than the limit authorized on the server, Sweet Home 3D will display a message requiring you to remove some furniture or images to reduce the size of this data. It's also now possible to delete homes hosted in the Online version. This feature is accessible through the Delete button that appears in the new version of the Open dialog box. 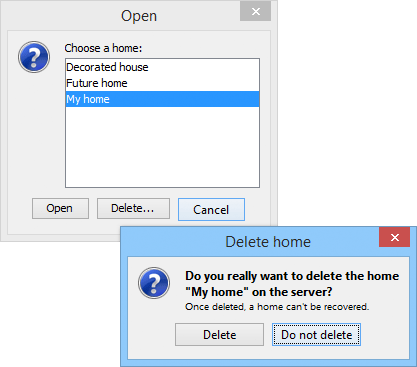 As deleted home will be completely removed from the server to save disk space, this action requires of course a confirmation. Note that I couldn't fix yet a bug that prevents from creating videos in the Online version, and I disabled this feature until I find a correction [Note: video creation works with Java update 7u67 and was enabled in the Online version again]. In the Furniture materials pane, the material selected in the materials list now blinks in the 3D preview included in the pane to help you find the material you want to edit. Sideways moves in the 3D view can me done with the Alt + left arrow and Alt + right arrow keys, eventually combined with the Shift key to move faster. For homes with multiple levels, the new Edit > Select all at all levels menu item will select all the items in all the levels of the home, to let you move them together or export them to OBJ format. The Select object sub menu shown in the contextual menu of the plan when you right-clicked on superimposed objects becomes the Toggle selection sub menu when the Shift key is pressed, to let you remove hidden selected objects from selection or add unselected objects to selection. When the Foot/Inch/Fraction unit is selected in preferences (i.e. Imperial unit system), the text fields used to edit lengths now show and accept lengths at this format, for example 1'11¼", and you may type decimals instead of the fraction character. Sweet Home 3D Viewer introduced new parameters that will let you choose the levels and points of view that the users will be able to select in the contextual menu of the 3D view. The bug that made some ugly black square dots appear from time to time in the photos computed at the two best quality levels should be fixed. Some users who used many different names for their objects, reported they couldn't save their preferences after a while and worse, that this saving was failing silently. This won't happen anymore. Collada / DAE format was replaced by KMZ format in Trimble Warehouse 3D a few months ago. As a KMZ file is actually a ZIP file which, among other things, contains a Collada DAE file that Sweet Home 3D was already able to read, users just had to replace the KMZ extension by ZIP to make it work in Sweet Home 3D 4.3. But this wasn't very handy and the KMZ extension is recognized by Sweet Home 3D 4.4. Running Sweet Home 3D with Java Web Start under Java 7 or 8 made the 3D view turn to grey from time to time for some Windows users. This was fixed and the coming versions of the installer version will probably be bundled with Java 7 or 8. Finally, I'd like to dedicate this version to two great contributors of Sweet Home 3D: OK Hoff for his support and the nice models he contributed recently, and sree.arun.kr for finding out the tip to remove black dots in photos computed with SunFlow. Thanks for the excellent job you did! in the above example. Thank you! 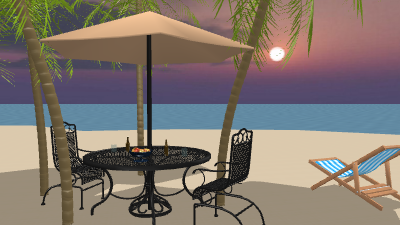 You can have a look by yourself in PluginFurniture.properties files available in each .sh3f file or in the repository: Here, the tree and the umbrella have a dropOnTopElevation property set to -1 (i.e. they will be ignored when objects are placed on them), and the table on the beach and the glass don't define this property (i.e. objects placed on them will be at their height, like before version 4.4). The desk in the first images has a dropOnTopElevation equal to 74.2 cm (the level of the table) whereas its height is 182 cm. Thanks for the service, Glad I came across the latest version 3.6! Keep up the good work. Great work! Thanks for all the time and effort you put in! I love this software, but if you can improve or refine the aerial view will be perfect for viewing the 3D image is focused in the middle of the project and do not have the freedom to focus on where we want. If you want to center the 3D aerial view on the selected items in the 2D plan, select the Aerial view centered on selection option in preferences pane. I love very much this Sweethome3D, please add for the roof plan.. I am having problems with the latest version 4.4, all of my structures and furniture has a jagged edge and I cannot find a way to fix it. I had no problems with the previous version! I want Render High qulity Spherical View with less time is there any possible way of quickly render?? Is there is any other lighting options is available for interior view ??? See the FAQ How can I speed up the rendering process in photo and video creation panes? I'm having problems too: in my PC, Intel Core i5, 4 Gb RAM, Windows 7 64 bits, when I'm adding some elements like furniture, when I'm adding the third or fourth, Windows freeze! I have to manually restart my PC, it happens every time. Any idea? Sorry this is not the place for support requests. Please use the forum. Its amazing what people are able to create and release on an open source base.